Scott Monteith is an entrepreneur with a successful track record of moving inventions from ideation to commercial success. He began his business career in 1991, launching the Stormceptor System into North America before there was an established market for stormwater treatment products. He has extensive experience in the areas of marketing, manufacturing, technology transfer, technology licensing, new product development, patent management, corporate development, international business and strategic planning. Scott founded Monteco Ltd. in 1995 and has served as its President and CEO since. Monteco has launched a successful portfolio of companies that include Biox, Imbrium Systems, Green Turtle Technologies, Filamat Composites, Imtex Membranes, Good Harbour Laboratories, Riptide Tek and AutoServe1. 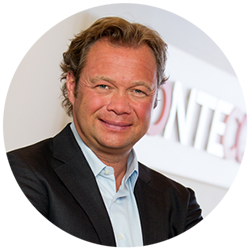 Michael Brandt is the Chief Financial Officer of Monteco Ltd. Partner at KPMG for twelve years, developing a $1.3 million client service base in the Media, Marketing & Communications, and Manufacturing & Distribution sectors. Prior to joining Monteco, he was the Chief Financial Officer of Loews Cineplex Odeon Corporation and Thomas Cook Financial Services. Chartered Accountant with a Bachelor of Mathematics degree from the University of Waterloo.